It's the foundation for moving images. You can’t get better evidence for this burdensome body than the photographs that Muybridge made of Leland Stanford’s white racehorse Occident. The animal’s body was carved into a sequence of 24 silhouetted images that record the graceful form of the animal’s gait. These motion studies, as they are known, were a first of their kind and were a precursor to the moving image. Because of Muybridge’s motion studies, we learned that for a split second, a galloping horse has all four hooves off the ground — a reality never witnessed before. Muybridge photographed Occident at Stanford’s Palo Alto estate in the spring of 1872 with the aim of improving the racehorse’s performance. Using a sequence of cameras set along a marked path, Muybridge transformed the body of the animal into an object frozen in time to be studied and improved. The symbolic force of the railroad millionaire turning his prized racehorse into a series of mechanical images cannot be overstated. And it was Muybridge who enacted this feat of industrial will. That same spring, as Occident went running along a numbered path, small banks that served middle-class and working-class patrons were failing across Europe due to dodgy loans, speculative lending practices, and the excessive costs of the Franco-Prussian War. 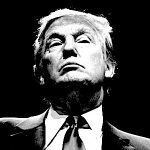 By the fall of 1873 the crisis reached the U.S., plunging even the robust American economy into what contemporaries called “The Great Depression” — a name that stuck until the 1930s. The U.S. economy faltered to a large extent through bond speculations by railroad corporations. Stanford and his colleagues at the Central Pacific Railroad played the market game well. It all sounds familiar and contemporary, doesn’t it? This thought struck me while walking through the recent exhibit of Muybride’s work at London’s Tate Britain. The retrospective opened amidst new austerity programs in the U.K. The right-leaning coalition government announced drastic cuts in public spending, slashing budgets for cultural institutions and universities, cutting back on social services, setting up plans to sell off forest lands that have been protected since the Magna Carta. Last spring in Washington, D.C., Muybridge’s sepia landscapes and innovative motion studies captivated patrons at the Corcoran Gallery not far from where Congress debated bank regulations and cuts in social programs. But those are political questions, and the Muybridge exhibit was about art, and the particular passions and inventions of a man who pioneered the science of photography. As the exhibition showed so well, Muybridge motion studies were about the experience of stopping time, and turning motion into mechanical reproduction. The show didn’t mention the 19th-century economic collapse. Maybe it didn’t want to remind us that industrialization and the annihilation of time and space had it collateral damage. 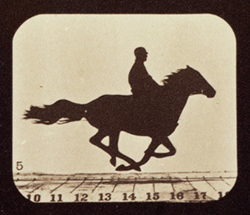 Stanford’s racehorse was only the first step, for the motion studies would consume Muybridge as he increasingly saw the camera as a tool of science and himself as a scientist. 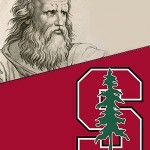 He would pursue this work in San Francisco and later in Philadelphia, and he would lecture on his studies across the U.S. and Europe. Beyond his initial studies of horses, there were other animals: pigs and dogs and cows, and wild animals from zoos. But there were also humans: athletes wrestling naked, two workers hammering an anvil, an athlete making a long jump, or a person simply walking up a short set of steps. We see women walking naked and clothed, pouring buckets of water, the liquid suspended in motion and time. We see another women, naked pulling back the covers of the bed and settling in for sleep. We see sword fighters and a contortionist, and one beautifully evanescent sequence of a woman dancing in a white sheer skirt that flows with her movements and clings to her body as if she’s an ancient Athenian statue. We also see Muybridge himself, aged and white bearded, half naked and fit, moving alone against a black background as if dancing or working or exercising. It’s not clear. But these motion studies captivate with both curiosity and eroticism. The large gallery space accommodated a slowness of looking at these quite small, movie-like still photographs. 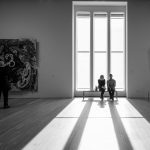 It allowed visitors to contemplate each frame as a unique moment. What is fascinating is how each shot turns the bodily movement into a set of actions, such that the wholeness of the action, like walking down a sidewalk, is lost to the fragments of each gesture or contortion of the body. Here we get the colossal and the mystical all detailed with Muybridge’s sensitivity to the camera’s power through lighting effects and perspective. Because of the time exposures necessary, images of waterfalls glow with a haziness and contrast with the hard-edged rocks. Serene lakes look like polished glass surrounded by expansive hills. 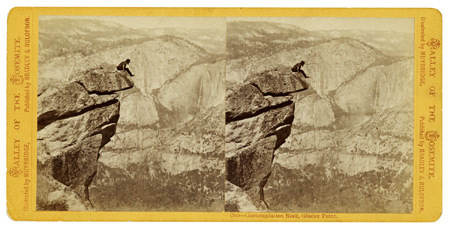 Muybridge was fond of grand perspectives, and he knew such images of the frontier were in demand back east. Often he photographed the sides of summits or cliffs from a precarious point, giving us a feeling as if we were the first to see this site — a place untouched by humans. He put us there on a secret mountain trail, glimpsing a panoramic view of a cliff in foreground and the expansive hills lined with steeples of pine trees, fading into a vast immeasurable world of sepia tones. Following these natural vistas are a number of photographs of San Francisco, the burgeoning city of commerce, speculation, and lawlessness. The city imagined all: immigrants from Asia and Europe, prostitutes, East Coast businessmen, ex-slaves from the South, Native Americans and Mexicans who traced their ancestors back centuries in the region. But we don’t see these people in the Muybridge photos. His photographs show the built environment set against the hills of the Bay Area. He made his famous 360-degree panorama of San Francisco atop a mansion built on the highest point in the city and owned by a director of Stamford’s Central Pacific Railroad Company. Requiring long hours of arduous labor, the panorama engages us by presenting the whole of the city in one sweeping vision. While the motion studies cut up the actions of humans and animals into gestures and movements, this panorama synthesized a singular image of the city absent of any real social life. The panorama gives us a god’s-eye perspective from the mansion of one of the wealthiest men in the country. It is hard not to remember this fact, this recognition that we stand looking out over the city from a place of privilege. 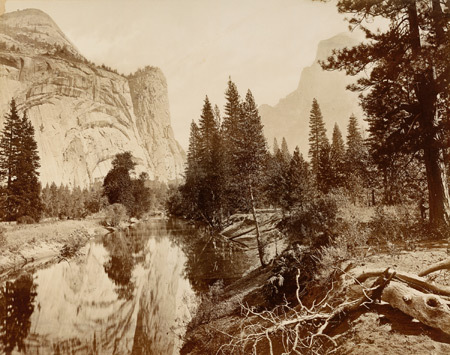 Many of Muybridge’s landscape photographs were government commissions that mixed documentation and propaganda. 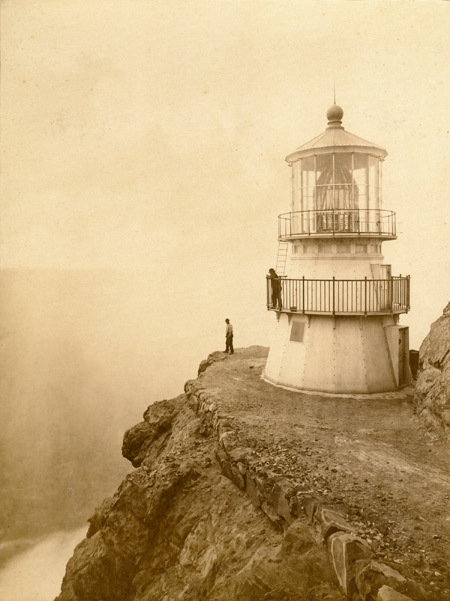 His series of lighthouses, commissioned in 1871, are stark and exacting. “Pigeon Point Lighthouse” for example, is cut in two by the dark cliffs on the right, the misty water and endless horizon of the ocean on the left. The white tower of the lighthouse rises behind a small white house; the afternoon sun is precise in its carving of shadows on the buildings, making the scene look like a Edward Hopper painting. There are two tiny, feathery figures just to the left of the buildings, standing on the cliff, facing each other. But it is hard to tell. They exist perhaps to show dimensions in the image, to give a sense of proportion between the structures and the horizon. But they are dwarfed by it all. 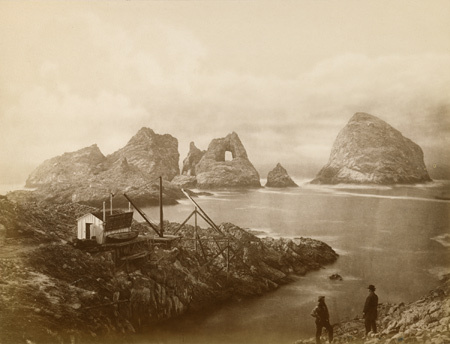 His photograph of the Alaskan coast, another commission by the U.S. government just a few years after the U.S. purchased the territory from Russia, present a diversity of Alaskan inhabitants, from miners and Native Americans to Russian Orthodox clerics, often standing awkwardly for the camera. In “Alaska Ter.—Sitka. Russo Greek Priests, Alaska” three Russian Orthodox Priests in black robes stand stiffly against a wooden building. Here, as elsewhere in these Alaskan images, you notice the huge distance between Muybridge’s camera and the subjects of his lens. But then, we can’t forget that Muybridge was traveling with the Army, capturing images of the territory to calm criticisms back in Washington, D.C. about the land purchase. Alaska was expensive, and would require more money to take care of. Muybridge’s photos were meant to illustrate the beauty of the region (though its hard not to think that the inhabitants often look as if they were lined up for a firing squad). Across the room from these publicity photographs, you learn that Muybridge was a murderer. The show displayed sensational news accounts and front page headlines that recount the night in October 1874 when the 44-year-old Muybridge tracked down Harry Larkyns, the alleged lover of his wife, Flora. Greeting Larkyns with the words “My name is Muybridge and I have a message for you from my wife,” Muybridge shot Larkyns in the chest. He died minutes later. 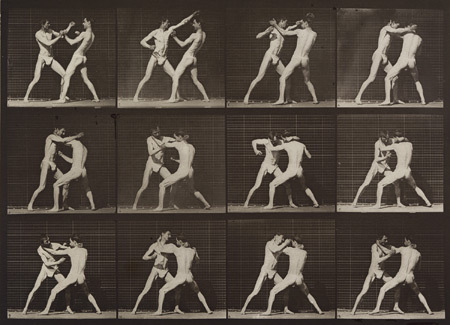 What sparked Muybridge rage? Coincidentally, it was a photograph. He found one of his infant son inscribed on the back by his wife with the words “Little Harry.” This, for Muybridge, confirmed what he had suspected for some time: that Larkyns, a tall and attractive dilettante and scam artist who had become close friends with his wife, was in fact the father of his child. While a jury acquitted Muybridge, believing his defense of temporary insanity due to domestic trauma, this aspect of Muybridge’s life haunts the work throughout the show. Here was a man who embodied the very metaphors that link the camera with the gun. It is difficult not to shake the reality that all those intricate, stop-motion photographs were taken by a murderer. And then I began to notice all the destruction that surrounded me. Most acutely true in the motion studies, there was throughout the show a deep sense that what you are looking at was in the process of becoming marginal, or insignificant, or destroyed. The horse. The vast landscapes of California, Oregon, and the Alaskan coast. The way of life for the Modocs. The economic collapse. In his essay “Why Look at Animals?” John Berger explores how zoos frame and marginalize our experience of animals. “However you look at these animals,” writes Berger, “even if the animal is up against the bars, less than a foot from you, looking outwards in the public direction, you are looking at something that has been rendered absolutely marginal; and all the concentration you can muster will never be enough to centralize it.” For Berger, this distance between man and animals is embedded in the logic of imperialism and capitalism that renders animals mere products of industrialization. Muybridge’s photographs are part of this history that Berger points us to. Many of his studies in the 1880s were conducted at the Philadelphia Zoo, and you can’t help but be reminded of the ways the 19th-century capitalism so actively domesticated nature when looking at his motion studies. But these studies not only transformed how we look at animals, they also changed the way we looked at ourselves. If the horse was eclipsed by the train, could it be that human experience has been eclipsed by the photograph and the film?